Howard Scott Warshaw. Sound familiar? Well, it will if you are into video game history or pop culture. See, Mr. Warshaw is often credited for the downfall of the video game business in the middle 1980’s. Hard to believe that the video game industry nearly died in 1984, but, it is true. And Warshaw’s E.T. game is almost always given as the reason. Well, it simply isn’t true. Let’s roll back to 1976 when the video game system, as we know it today, came about. Fairchild introduced the Channel F, the first programmable home game console. It was very crude, had awful controllers and, the games? Well, most barely qualified for that moniker. But, it was new and very exciting. RCA followed suit with its even worse Studio II. The Studio II, however, gained some popularity amongst computer hobbyists as you could easily make it do more than just play the cartridges. Later, in 1977, Atari followed suit with its Video Computer System, or VCS. The VCS, later known as the 2600, had better graphics, more colors, sound from the television and most importantly, more games. Between 1977 and 1980, though, the home game market kind of languished. Initially, sales of the VCS were slow. It took the home game port of Space Invaders to start moving the system. From then on, it was a huge success. Others entered the market, like Intellivision and ColecoVision, but Atari remained king. Atari’s work atmosphere was very laxed. No dress code, no set hours to work, lots of parties and lots open use of drugs and alcohol. Somehow, it all seemed to work. Atari went on a hiring frenzy and, in a brilliant move, hired a young programmer named Howard Scott Warshaw. Warshaw’s first assignment was a conversion of the arcade game, Star Castle. Realizing that a port was not feasible on the VCS, now called 2600, he convinced his management to let him take the best parts of the game and come up with something new. Warshaw decided to come up with a backstory as well..a first for an original game. 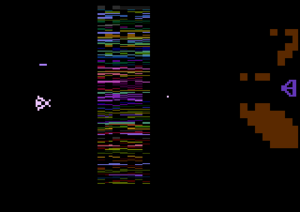 So, not only did he succeed in developing a little game called Yar’s Revenge, he also set two precedents: the back story and the embedding of the programmer’s initials. This had happened only once before, in the game Adventure, but Warshaw would continue it in all his games. Yar’s Revenge became the first original game for Atari to sell more than one million units. It was a bonafide hit. Warshaw was asked to develop the game version of Raiders of the Lost Ark. Again, when it was released, the game was a huge hit, selling over a million copies. Warshaw was now a money machine. Which is why his phone rang one day, a day that would, ultimately, lead to his leaving Atari and changing careers. That phone call was the one asking to develop the concept and then code the home version of E.T., the Extraterrestrial. Oh, he only had FIVE WEEKS to do it. Well, he did it. The game was given to Steven Spielberg for the final approval and, he liked it. Spielberg approved it and then went on television hyping the game. Millions of the carts were produced. Some say more E.T. carts were made than there were consoles. Incredible. Atari actually thought that more consoles would be sold because of this game. Christmas rolls around and, yes, the game sold very well. However, something unexpected began to happen…people wanted to return it. It was too difficult. It was unplayable. It sucked. Over the course of the next few months, Atari stock fell to a new low, Ray Kassar was forced out as CEO and, Warshaw left the company. The home video game market was dead. It only needed to be buried. Well, it was buried, sort of. Atari took a bunch of unsold stock, wrote it off and then buried it in a landfill in Alamogordo, New Mexico. For thirty two years, this part of the story was legend: there was no proof, other than a generic looking photo taken on the day of the dumping. In 2014, however, the loot was discovered and, yes, Atari had, in fact, buried a bunch of stuff, but not the millions of E.T. carts that were alleged. In fact, E.T. made up only 10 percent of what was found. Warshaw was on hand for the digging. Warshaw, now a psychoanalyst, commented that he was touched by all of it. Saying that something he did thirty plus years ago was still being discussed, brought up fond memories by some and elicited such frenzy, was, well, heartwarming. I would agree. The fact is that E.T. had little to do with the game industry downfall. Sure, it did not help, but it certainly did not cause it. The game was not great, but it was far from horrible. Far from ‘the worst game ever.’ No, there are far more deserving games for that title, like Chase the Chuckwagon…which had more to do with the downfall than E.T. And, Warshaw? I’d say he should go down as one of the most brilliant programmers of all time. This man, who had two million plus games under his belt, did the impossible in FIVE WEEKS. From concept to completed game for what is, arguably, one of the most difficult platforms to program, was genius. Poor Atari. They announced that they are going bankrupt. Again. The US arm of Atari filed for bankruptcy and intends to sell of its most prized possessions: it’s intellectual property from the 1970’s and 80’s as well as the name and logo. That means we will very likely see yet another company claim the Atari name and sell remakes of games like Battlezone, Pong and Asteroids. This will be the sixth incarnation of the storied name. Yep, sixth. Let’s take a look at the history of this company. Atari, with Nolan Bushnell at the helm, began in 1972. Initially, the company sold a game called ‘Computer Space’, but it was complicated and, aside from being a cool prop in several movies, never gained any traction. The company’s next venture, Pong, was a huge hit. The company went on to develop home versions and, after settling a lawsuit with Magnavox over the home video game, had some success in that market. They developed the VCS but lacked resources to marked the new console. In steps Warner Brothers and sale number 1. Tramiel had some success with Atari by marketing decent home computers. In 1986, he decided to market and support a new console, the 7800, which was actually ready to go to market in 1984, when he bought the company. Not wanting to sink the company in a market that was now dead, Tramiel shelved the console. By 1986, Nintendo and Sega were seeing a renewed interest in home gaming, so he introduced the now obsolete console. He also brought out a smaller and cheaper version of the renamed VCS (the 2600.) Atari languished for the next few years and was reverse merged with the much smaller JTS company, a maker of mass storage for computers. Sale number 3. Not long after that sale, Hasbro Interactive purchased the name and assets of Atari. Sale number 4. Hasbro Interactive was then sold to Infogrames in 2000. Infogrames renames itself Atari, SA in 2001. The US division, GT Interactive, becomes Atari, Inc.
During the intervening years between JTS’s sale and Hasbro’s sale, nostalgia swept in and, suddenly, old Atari games were hot again. Other dead consoles also saw renewed interest and Atari’s biggest competitor in the 80’s, Intellivision, was probably more popular that it was new as a result of this nostalgia. Indeed, I had to go off and buy every old game collection I could find. Atari VCS games, Intellivision games and others in both software collections for Windows and actual hardware like those plug and play units. What’s interesting, however, is the curse that seems to follow the Atari brand. Every company that has utilized the name has either gone out of business or was sold. Hasbro, perhaps, was most successful and that attracted the eye of the French company, Infogrames. Even they, though, could not escape the curse and the US division is about to die. Atari could be a great company. They have a great heritage, but seem to be cursed. I know we will see yet another incarnation and the beloved games will stick around. Maybe forever. Who knows. Since getting the iPhone 4 a few months back, I’ve managed to get a few accessories for it, either through purchase or gifts. One of them really brings out the kid in you: the iCade Jr. iCade, for those who do not know, is a mini arcade cabinet sized for the iPad. It has a real joystick (that would look at home in an actual arcade cabinet) and four buttons arranged in a diamond pattern. 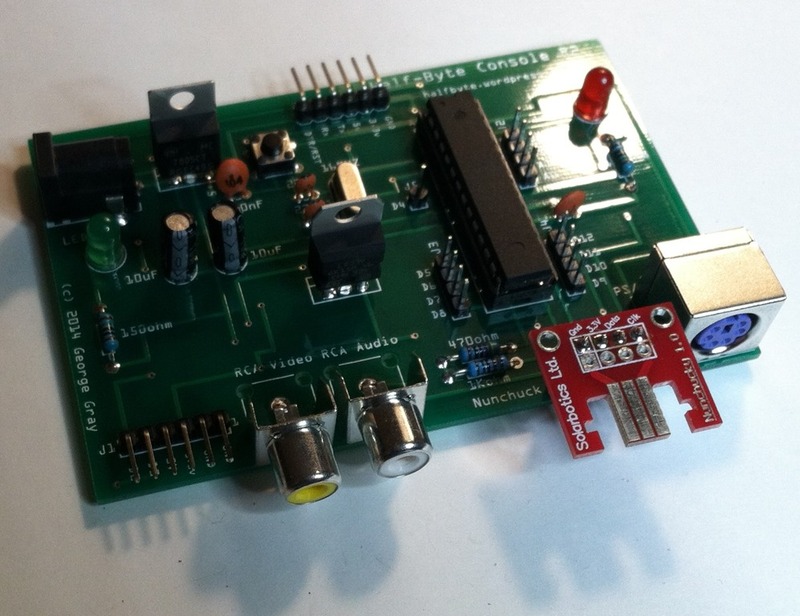 The device uses bluetooth, so it could really work with any bluetooth enabled tablet. Of course, the games themselves need to be compatible with the device and, sadly, most are not. There is a list of compatible games on the iCade Jr. web site. Even though the device is diminutive, it really does ‘feel’ like the real thing…in miniature. I find that it has to be played on a table top and not one’s lap, not a big deal, but limits its portability. Some of the games need to be played with the phone rotated, so having phone sit sideways on the device is kind of a let down, but, once in the game, you really don’t care. The biggest disappointment, however, is also a big plus: it is NOT a dock and has NO physical connection to the phone. There is, however, a slide through for your charging/data cable, so it does make a cool ‘dock’ to charge the phone. This, by the way, also makes it more universal. At it’s current sales price of $9.99 at thinkgeek.com, you could buy to use just as a cool charging station for your device. I’m guessing, though, that there are games on the Android side that will work with the iCade. One caveat: while the iCade should work great with the iPhone 5, the top may not shut all the way since the iPhone 5 is taller. Lastly, since the device IS bluetooth, you can ALSO USE THE DEVICE with the iPad. So…prop up that iPad and use the iCade Jr. as a controller as well. And, for under ten bucks, it’s a rather cool controller. 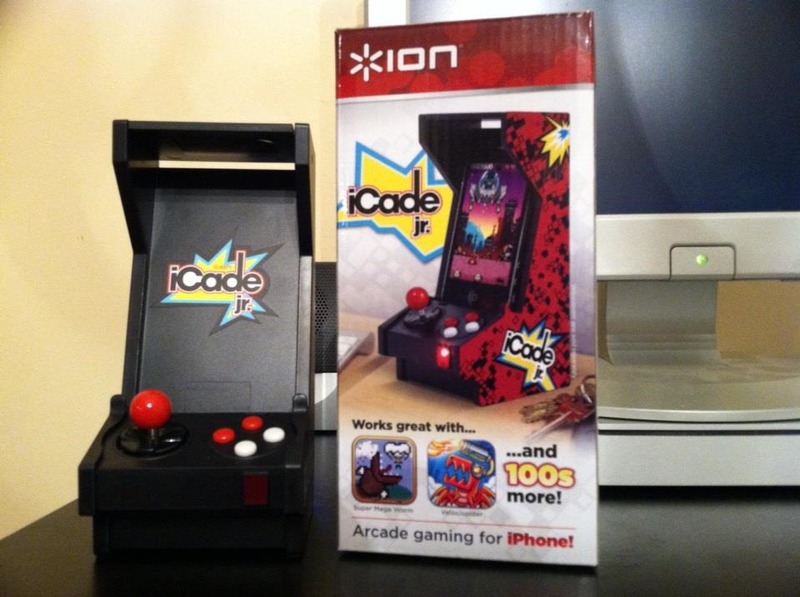 iCade and iCade Jr. are from ION Audio and can be purchased from retailers like Target, BJ’s Warehouse and thinkgeek.com. You can find a list of compatible iOS games here. October 18, a date that will live in infamy. In the video game world, that is. For, that is the day that Nintendo brought forth the Nintendo Entertainment System on the shores of the United States. Two years prior, however, if the stars had aligned differently, it might have been called the Atari Entertainment System and we would have the Atari branded Wii instead of Nintendo’s Wii. See, Nintendo wanted to break into the North American video game market with it’s Famicom console. In 1983, they had reached a deal with Atari to market the Famicom in the United States. By that point, Atari was in trouble and needed to replace its aging lineup of consoles. It had the 7800 in the works, but needed something better. So, they were amenable to the Nintendo deal and were set to sign the final contracts during the summer 1983 Consumer Electronics Show. As the story goes, however, Atari officials were strolling around the show floor and saw a demonstration of Donkey Kong running on the Coleco Adam computer. Furious about what they saw, Atari refused to sign the deal. However, Nintendo had the matter cleared up in short time, but, by then, Atari was broke and could not follow through with the deal. Atari was sold by Warner Communications to Jack Tramiel who promptly shut down the console business, leaving a warehouse of ready to market Atari 7800 consoles, accessories and games to sit and collect dust for nearly two more years. Nintendo decided to go it alone and, after redesigning the console to better fit the US market, tested sales in a few key markets. Not only did they sell well, they sold out. Nintendo decided to nationwide with the console in 1985 and the rest is history. 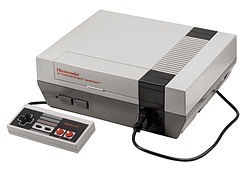 NES went on to sell millions of consoles and tens of millions of games. The home video game market was back from the brink of oblivion. By that point, Atari was doing well in home computers but was dead in the home console market. Seeking to expand again, Tramiel decided to do something with the warehouses of 7800 consoles. So, Atari released the console and set out to introduce other home consoles. The venerable 2600 was redesigned and re-released. Several keyboard less versions of the 400 and 800 computers were released as game consoles and, in 1992, the Jaguar, Atari’s last console, was announced and releases afterwards. In 1995, Atari finally died as a standalone company. The name lives on today, but is in something like the sixth incarnation of the company. It still retains the intellectual property, it’s most valuable asset, from the early days. In fact, they have released four versions of the first three consoles in plug and play versions. Nintendo fared much better. After the NES, came the Super NES, the Nintendo 64, the GameCube and the Wii. GameCube was the least successful of all the consoles but was, perhaps, the one with the best games. The SNES and the 64 introduced many of the better franchise games, like Super Mario Kart and the Super Mario games. They also had a line of very successful handheld consoles like the GameBoy, GameBoy Color and the DS line. Perhaps Nintendo’s biggest strength is its ability to think outside the box. When Wii was announced, it was panned, universally, by the press because of its perceived hardware weakness. But, like they say, it’s the gameplay stupid and the motion controllers worked and worked well. Most of the games were fun, even if the motion control was just a gimmick. Wii sold in record numbers, beating both Microsoft’s XBOX 360 and the over engineered and over priced PS3. Gamers are fickle, however, and, after four years, the Wii finally showed its age and sales have fallen dramatically. Finally, the gaming press was right: XBOX and PS3 would outsell Wii. Well, that’s not entirely true. They have outsold it on a monthly basis, but have a ways to go before completely outselling the life sales of the console. It’s replacement is due out in November of 2012, so we will see if Nintendo can continue generating the hot consoles. To think that we damn near had an Atari powerhouse and why we don’t is a bit sad. If Atari had been able to fulfill its end of the agreement, the video game world could be quite different today. We, likely, would not have a Microsoft branded console at all. Or, had Sony been able to market its Playstation attachment to Atari instead of Nintendo (who shitcanned it for a similar device from Philips, which never released here in the US) we may not have had a PS2 and, thus, the AtariCube may have taken the world by storm. If only.